I am married to Mindy (Horn) Edwards (Nicolet Class of 79) with a son, Michael (born 4/6/92), residing in Thiensville, WI. A nostalgic note: Barb Cotey-Fischer was the delivery room nurse when Michael was born. Mindy retired after 25 years of service due to health issues. As a Flavor Chemist, her work focus involved matching/developing flavors for a wide variety of applications from foods, medicines, tobacco, and more. She has not allowed MS & other auto-immune challenges interfere with her staying involved. She has become a crafty, prolific designer of jewelry and tableware. Michael graduated from the Marquette School of Law (2017) and is now practicing family law in Fond du lac. My twin sisters, Lisa & Lynne are '76 Nicolet alums. In 2014, I launched "Fix-My-Bytes" - specializing in PC computer/laptop repairs, on-site/remote servicing, used computer sales & e-waste recycling. Generally, I cover the Milwaukee metro area/SE Wisconsin & do provide national remote support. I strive to help all my clients to "feel in control" while not getting "ripped off". A number of my clients are '73 & other Nicolet alumni & faculty. I am also very active with the Glendale-North Shore Chamber of Commerce. I earned CompTIA/A+ certification for computer servicing - a difficult exam to pass (2013). Prior to "Fix-My-Bytes," I was a Professional Organizer, employed by Action Organizing Services LLC (Milwaukee). I am in 3 of 4 episodes we filmed for A&E's "Hoarders" & TLC's "Hoarding: Buried Alive" - including a few brief snippets of me at work (the most famous clip - scooping up a rotted pumpkin in a bio-hazard suit). The reruns of these episodes continue to run on cable & past episodes can be viewed on A&E and TLC's websites (if you have a stomach for it). I continue to provide web-content support for the Glendale-North Shore Chamber of Commerce as well as this NICOLET '73 Web portal (with Rick Bernstein). I maintain a collection of (mainly) classical/opera/jazz/blues/folk/musical recordings (CD's/LP's/tapes). On radio, my favorite programs are 'Prairie Home Companion," "Metropolitan Opera Broadcasts," "Blues Breakers (WXRT-Chicago), and "The Midnight Special (WFMT-Chicago) and Jazz-Blues Programming on WDCB (College of DuPage, Glen Ellyn, IL). Of course, I listen to the "Brew Crew" on radio & TV too. Baseball - - Milwaukee Brewers! In 2001, I assisted a close friend (Leonard "Oakie" Brumm) to publish and promote a book ("We Only Played Homes Games - Wacky, Raunchy, Humorous Stories of Sports & Other Events in Michigan's Maximum Security Prison). "Oakie" was the first recreation director for a SuperMax (Marquette, MI - early 1950's). It is true that the Detroit Red Wings actually played a hockey game against Oakie's "Prison Pirates" at the prison hockey rink. The book has been read world-wide and still is available for purchase. My years at Nicolet (and Maple Dale) were blessed with many great friendships. I thoroughly enjoyed working on three reunion committees & building on classmate friendships of those that I didn't know or know well. I am really intrigued by how close our class of '73 really is & that we continue to support each other - thru the good & challenging milestones. My extra-curricular activities included Forensics, Debate, Concert Band & Student Council. One of the "hot buttons" was the Hot Lunch Program overhaul (without fatalities), establishing/locating the "Smoking Lounges" and of course, the memorable rebirth of "Frontage Road" to "Jean Nicolet Road." "Once upon a time" when Nicolet & many school districts had money - do you remember when the administration hired monitors to ensure that no one was smoking in the Johns? Their sole purpose was to "re-direct the offenders" to the designated smoking area (in the back in a lower concrete slab under "F-wing"). BILL EDWARDS has left an In Memory comment for MIKE KROEGER. When I think of Mike during our Nicolet years, everything I associate with him is exceedingly positive. He was outgoing, compassionate, good natured, and of course very well-liked amongst us all. After high school & college, Mike stayed active in Glendale, and the Nicolet High School district - - with the recreation dept. & teaching. I am sad that he has left us too early. R.I.P. Mike. BILL EDWARDS has a birthday today. BILL EDWARDS updated profile. View. BILL EDWARDS has a birthday today. New comment added. BILL EDWARDS has left an In Memory comment for Profile. Kathy Schultz Raddatz best describes how I remember Joan. Indeed she was sweet, bubbly, loved to laugh - - and of course very bright. The same warmth radiates with twin brother Jim as I recall. As everyone has expressed, I too was very stunned to learn of this from Darcie and can't help but question why those among us are taken from us so early when yet there should be a lot of life and new chapters to still write. G-dspeed to twin brother Jim, family, loved ones and to those among us who were very close to Joan. Paul & I became acquainted our freshman year in homeroom. (For the record, our homeroom teacher was Dave Arnott and we were in F-Wing library.) We would share a library table with a couple others as Mr. Arnott and the morning announcements were read from the PA.
What can I say about Paul? He was 100% nice, friendly, engaging - - - not any hang-ups, facades - a person who almost always had a smile on his face. Paul was a "go-with-the-flow" type of gent. That doesn't he wouldn't speak his mind if he had to, but he non-controversial,didn't make waves - - could get along with just about anyone.. In later years, Paul & I would chat on occasion as we both were in the printing industry for many years.At his print/grapbics shop on the east side (Milwaukee), the shop culture was also friendly, non-stress - but Paul & his staff were all hard workers and with 100% integrity. I was saddened to learn that such a nice human being such as Paul had to struggle with Parkinson's Disease. At least he is no longer suffering - but I will miss Paul. G-dspeed. during the filming from A&E's "Hoarders" (Premier episode - aired August, 2009). Standing L-R: Bill Brase, Andy Palay, Linda Reck ('74) & Mike Reck. 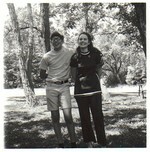 Doctor's Park Picnic (Summer 1971): Bill Edwards and Jill James.